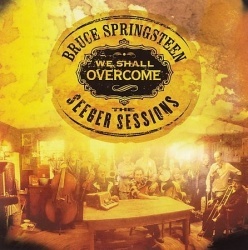 Bruce recorded the song with The Seeger Sessions Band for his 2006 album We Shall Overcome: The album was recorded over the course of nine years at Thrill Hill East, Springsteen's home studio in Colts Neck, NJ: During these sessions, all of the album's songs were cut live in the living room of Springsteen's farmhouse – they were not rehearsed and all arrangements were conducted by Springsteen as he and the band played them. "We were doing trapeze without a safety net," Sam Barfeld told Backstreets magazine. 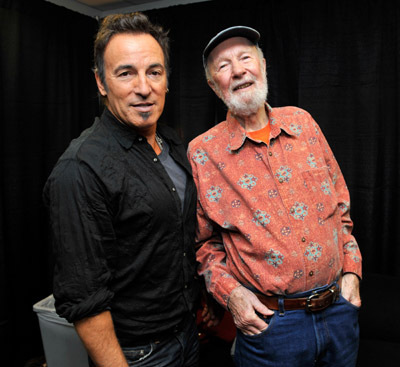 "He plays the song for you once, a couple of arrangement ideas. Have enough time to scrawl out a chord chart, and then boom! You record." "...Yes, yes….it´s good to be in Wisconsin….I told myself ´Wisconsin, they´re hungry out there ….this is a great work song, it was written by Thomas Allen, there was a whole….Erie Canal, when it was built, it was considered the eighth wonder of the world….it changed the face of the northeastern part of the country, the way goods got to market and people got around….it spawned an entire genre of songs appreciating the mule….it was known as the years of true mule-appreciation….they´ve lost a lot of status since that time but at that time…. they had something... so,…. 'Low bridge, everybody down,´ oh, you can help me out, need a little humming, a little humming…"
Erie Canal is a traditional American song .The popular song "Low Bridge, Everybody Down" was written in 1905 by Thomas S. Allen after Erie Canal barge traffic was converted from mule power to engine power, raising the speed of traffic. 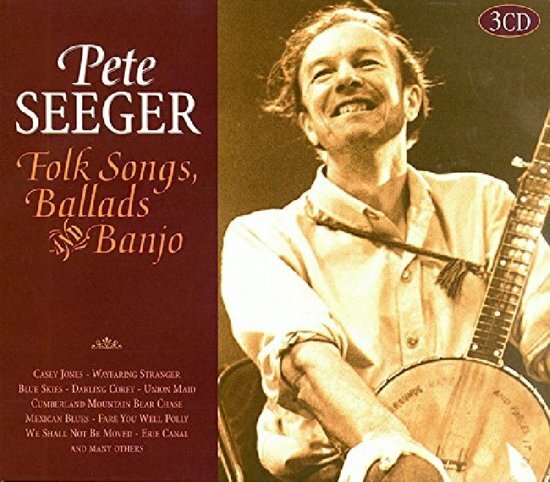 Also known as "Fifteen Years on the Erie Canal", "Fifteen Miles on the Erie Canal", "Erie Canal Song", "Erie Barge Canal", and "Mule Named Sal", the song memorializes the years from 1825 to 1880 when the mule barges made boomtowns out of Utica, Rome, Syracuse, Rochester, and Buffalo, and transformed New York into the Empire State. 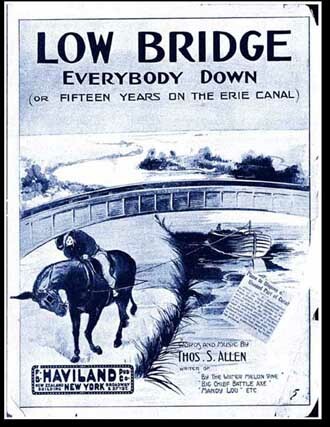 The music cover published in 1915 depicts a boy on a mule getting down to pass under a bridge, but the song refers to travelers who would typically ride on top of the boats. The low bridges would require them to get down out of the way to allow safe passage under a bridge. Where would I be if I lost my pal?